An innovative exhibit at the San Francisco Exploratorium, The Changing Face of What is Normal, invites visitors to explore unusual terrain among the usual contents of the museum. 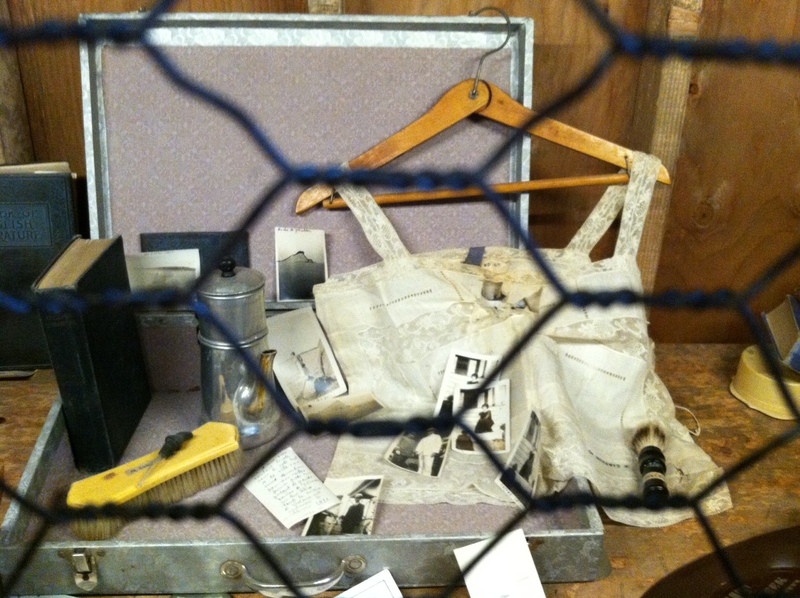 Objects found in the long-forgotten suitcases of former patients at Willard Psychiatric Center, a New York state mental facility, form the heart of the show. Critical reflections on the history of the DSM (Diagnostic and Statistic Manual of Mental Disorders) provide an intellectual framework for interpretation. Senior Artist and Curator of the exhibit, Pamela Winfrey, sat down to talk with Lisa Haushofer about the emotional dimensions of the visitor experience. How did the idea for the exhibit first emerge? It began on a family vacation, going to the Glore Museum, a museum on psychiatry in a little tiny town called St Josephs, Missouri. It was created by a man who had worked in the psychiatric center for 20 years, and who was really interested in the history of psychiatry. He has artifacts from the early 20th century and life-size exhibit experiences with mannequins in them. [The Glore Museum exhibits models of historical therapeutic and restraint devices. Mannequins are placed in the devices in order to make it easier for a visitor to imagine how they would have been used]. For example, there was a life-size enclosed “hamster wheel” that you would be put inside until you were just too tired out to be hysterical. Or a bench that you would be sitting on and it would fall away and drop you into cold water. But I thought it wasn’t so powerful to see a mannequin in these contraptions. What would really be powerful instead would be to actually be inside them. So I asked one of the guys in the museum workshop if he could build one for me, to see if we could make a really interactive exhibit. Not that it’s the same as what it would have been like to be put in one of those restraints or therapeutic devices. But, could you put people into an imaginative state so that they could think about being in them in those situations, to be in somebody else’s shoes. Then there was controversy around the publication of the DSM V [May 2013]. It was initially supposed to get published the year before we opened, [April 2013] but instead it was postponed to be published a month after we opened. I thought this would be really interesting as a conflict. The editor of the 4th edition [Allen Frances] emailed the editor of the 5th [David Kupfer],and innocently said, “I would like to know what you guys are up to.” The new editor pretty much shut down the information. For that he was accused of not acting according to good scientific practice in collegial spirit. Everybody got on this bandwagon, and the DSM website was opened up. It was a very big deal. So after all these controversies DSM V finally came out about a month after the exhibit here opened. I thought it would be very much on people’s minds. Then of course there were all these events happening in the United States, all the shootings in the theaters and in the schools, and people were really thinking about this [for background about such shootings in the United States in 2013, see here.]. The exhibit is centered around a number of suitcases and the objects inside them which were found in the attic of a mental health facility. How do these suitcases relate to the controversies you just described? I was researching mental health, and I came across a kiosk show [The lives they left behind] that had cycled through libraries. It contained a few suitcases, but mostly graphics. I was very interested in the power of the actual object, how incredibly powerful it is to see something for real. I tracked down the curator of the show, Craig Williams, who is a senior historian from the New York State Museum. There was a hospital that was de-accessioned, and somebody said that there were objects in the attic. They poked through the ceiling into the floor of the attic and found 427 suitcases. They realized this was of historical significance, so they called the New York State Museum, and Craig came and took all 427 of them. He is the hero of this story. He understands that objects actually equal people; that if you were simply to discard all these objects, you would be erasing all of these people from history. I met him and went to see the objects. He also introduced me to psychiatrist and poet Karen Miller and photographer Jon Crispin, whose contributions were integral to making the exhibition successful. Karen obtained access to the patients’ records which is quite difficult to do. This access was essential in understanding their stories. Objects standing in for people or evoking people is really interesting. What would you say are some of the most engaging objects for you, and what kinds of people emerged as you were discovering these objects? One of the most amazing people was Madeleine, who was probably schizophrenic. She spoke five languages, and had a huge library. One of the striking things about her collection was that there were so many unsent letters in which she was begging to be let out of the hospital, that she didn’t belong there. She wrote to everybody: she wrote to governors, to teachers, to anybody she could get her hands on. I felt that they were so poignant because they were unsent. Another poignant story was of a man named Frank. He was an African American military man, who went into a diner and was served on a chipped plate. He took that personally and thought they did it on purpose. So he left the diner and was kicking a garbage can down the street, creating a ruckus and becoming a public nuisance. My guess is that he resisted arrest but we don’t know for sure. We do know that he never got out of the system. From his records it appears that he was probably homosexual. This was probably a hard thing for him to deal with at the time. One of the points of our show is to create an emotional environment in which people realize that it is a matter of luck to be born today, in this country, and to shrink the division between us and them. That was a big part of the curatorial desire. Any favorite objects for you? The letters were very interesting. Some of the objects are very odd. There was a woman who was a nurse, who had a number of medical objects, like a douche and hypodermic needles. But what is interesting about most of the objects is how not special they are. They are just objects that you and I would bring. They are quotidian and average and everyday, like family photographs, books. So in some ways it is quite the opposite: they are so normal. So you had these suitcases with the objects, and you had the context of the DSM controversy. Did you at any point find that it was difficult to connect the two, or were you ever considering alternative frameworks for this collection of objects? Initially we thought there was going to be much more space, so we were going to do an exhibit on The Changing Face of What is Normal that was much larger, not just about mental health. Then I found out I would only have 1700 square feet, and I thought I’d better narrow down. And obviously this is not at all a comprehensive show. It developed in an organic way. I had the advantage of partnering with my colleague, Hugh McDonald, who has a PhD in cognitive psychology. He wanted to make sure that our treatment of the DSM was not simply presenting the DSM as a volume that has changed in size, but that it has changed in complexity as well. 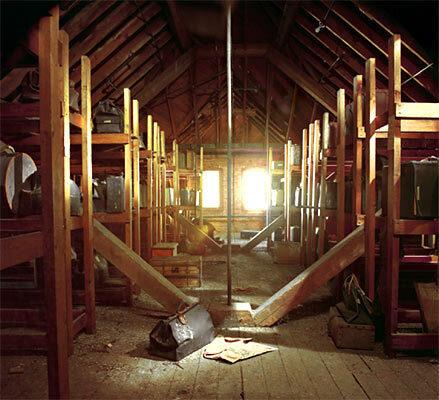 I knew that there were disparate parts: the suitcases, the DSM, an area in the back that was originally intended for people to contribute to the space, and the idea of the restraints. They were pretty oddball things put together. But through the organic process, what started to emerge was that one of the major linkages was really about language. The DSM was created in the 1940s after everybody came back from the war. The doctors started seeing all these symptoms, but they couldn’t talk about them because they didn’t share the same language, the same medical terminology. Once they realized that they needed to use terminology for these conditions, they were able to compare notes. If you look at the back-files of the patients, you can see for example that they were labeled with “dementia praecox” which was a term for almost everything that doctors would come across. Karen Miller, who is a trained psychiatrist, was able to compare the diagnosis and treatment of that period with what the diagnosis and treatment today would probably have been, even without being able to see the person. If I were able to do it all over again, I would probably emphasize this issue more strongly. Was there concern in the curatorial team that by juxtaposing the old and the new diagnosis, the exhibit would create the impression that psychiatric diagnoses today are uncontroversial and that there was a kind of history of progress? I think this is why we made sure we had the six videos [the exhibit contains six video recordings of patients and mental health professionals commenting on the DSM]. One of the things that helped was that we didn’t want to take an institutional stance. It wasn’t that we wanted to say “the DSM was great” or “the DSM was horrible”. We really tried to create an environment that was more even-handed. I think we achieved that for several reasons. One is that we use six different people who talk about the DSM. Three of them are clinicians, three of them are patients, and one of them is both a patient and a clinician. We very carefully put the labeling of those six people on the right side, so that you wouldn’t know who the people are, or what their role is. You wouldn’t listen to someone who had some mental health challenges in a different way, than to someone who was a cultural anthropologist at Stanford. One of the women is known as a ‘Rosa Parks’ of psychiatry activism, because she was treated very badly in the 1970s. Her stance was: you should never label anybody, ever. Other people confess they were so happy to find somebody else suffering from the same condition as themselves. I was very fortunate to find Stephanie Bailey, a young woman who handled the development of the videos as well as preparing the objects. She made sure that the videos were balanced in terms of race, gender, and point of view. There are also four sound stations in the exhibition of interviews with the original caregivers of the hospital. This was a small, company town [Willard, NY], and the hospital was the biggest support for the town. Before the 1970s, many of the patients came down and worked there, or on the large property of the hospital, which had an apothecary shop, a garden, animals etc. It was a permeable relationship. There was one cinema and it was at the hospital, and the kids would go up and see films there. They had basketball teams and theater, all kinds of things. So we tried to get people to understand that it wasn’t like One Flew Over the Cuckoo’s Nest, which is such a strong cultural reference for anybody in the US. We made sure to talk to a lot of caregivers. What is interesting about those particular recordings is that a lot of people were third generation caregivers and had been at the hospital before psychotropic drugs. They were very frank, talking about what they had to do to restrain people before the advent of psychotropic drugs, how when psychotropic drugs became popular they overdosed people. They struggled hard to try to figure out how to deal with this complex human behavior. It was pretty apparent if you dug just a little bit. The exhibit is in striking contrast to some of the other exhibits at the Exploratorium: it is object-based rather than installation-based, immersive rather than illustrative, and resonates with visitors on an emotional level as well as on an intellectual one. I’m curious, how did visitors react to the exhibit, and did their reaction in any way surprise you? Was it in any way different from what you had hoped they would take away? It is interesting because there was a period when I went to my boss and said that I didn’t want to do this show because of all the things you mention. I felt like it would be so different for the Exploratorium that it wouldn’t make any sense. I felt like I was in some way being held up to fail. My boss, Tom Rockwell, said he really wanted me to do this. There were many challenges: ideally you would do a show like this in a space that would allow you to have transition time, and different lighting than the rest of the floor to create a different environment. But given that it had to be open because of fire codes among other things, it is surprising how effective the result is. We were concerned that children would damage the exhibit, but most children poke their head in, and they are just not that interested. It is obvious it is not for them. But there is something which works in that space for adult visitors. I am seduced by physical phenomena to a degree, but I am a playwright, so I am more interested in humans and in emotions. I joke about the Exploratorium existing only from the clavicle up because everybody is intellectual. I am more of an emotional person and I don’t approach the world from a scientific point of view. I appreciate it, I have been trained in it, but that is not my basic heart. So for me it was amazing to see that actually there is a ton of people out there who are just like me. They go through the blinky lights, they go through the natural phenomena, but they really love this show. Every once in a while, probably once a month, I will get a long email from somebody, saying that it spoke directly to them. 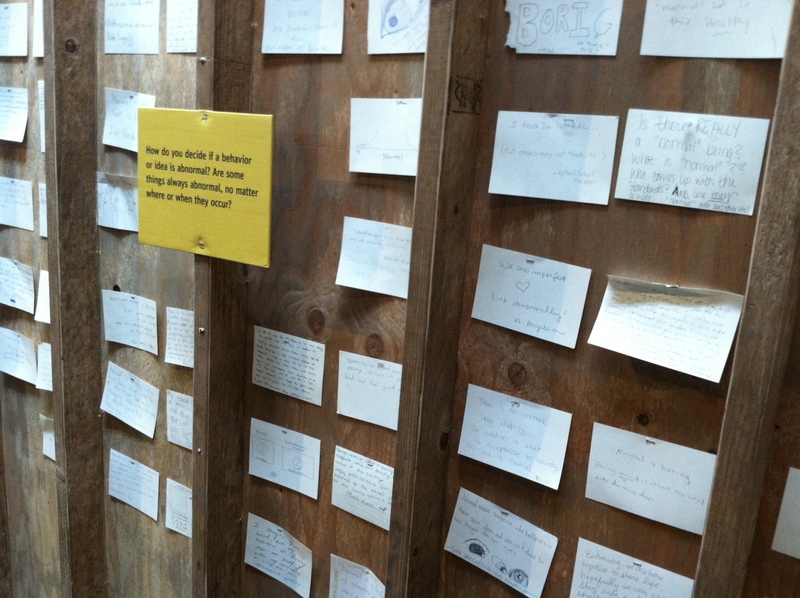 The reason why we had to stop the cards with personal comments from visitors was that we couldn’t keep up with them. There were thousands and thousands of messages; people pouring their hearts out. So you could see that it was really hitting some place strong. We have had other exhibits that have allowed people to comment, and we have never had this flood of replies. Some visitors were crying on the way out of the exhibit because they had been so moved by it. It is more successful than I predicted. It turns out that this particular topic, mental health, is something that people really care about, and that they have a personal relationship with. I didn’t know that at the beginning. I learned a lot. What would you say are some of the challenges, pitfalls, and also some of the opportunities of trying to convey such a complex history with an exhibit? I know it didn’t hang together as a comprehensive show. For me its flaws are just right out there. But what was surprising was how effective it was even though from an intellectual point of view it doesn’t hang together. I think it must be the power of the objects, and the human story that saves it and makes all those gigantic flaws (that you can drive a truck through) not so important. To me they are important, but the people that are going through do not comment that it is not a mental health show. They say that they were so emotionally involved and affected. I think that that’s amazing. We also had some challenges from an environmental point of view, and with regard to safety. But the exhibit hasn’t been destroyed, even though they are only behind chicken wire. I wanted these objects to be as close as possible, physically and psychologically, so I wanted there to be no glass because that always distances the objects. The unintentional consequence of the chicken wire was that people were reminded of a concentration camp. I didn’t know was going to happen. What will happen to the objects and the papers once the show is over? Have there been any conversations with archives? I am worried that when the show goes down the objects will be destroyed. I don’t think that the New York State Museum is particularly interested in these objects. Last I heard, they were trying to get rid of them. Craig has retired, so they have no advocate. The ongoing life of the exhibition is still in question. I hope that the show will be able to travel to other places. It is designed to fit on a flatbed truck, and whoever takes it will just have to pay the shipping cost. I am very afraid that all of the objects are going to be thrown away and that all those people will go too. “The Changing Face of What is Normal” will be on view at the Exploratorium, San Francisco, through summer 2014. Details can be found here.